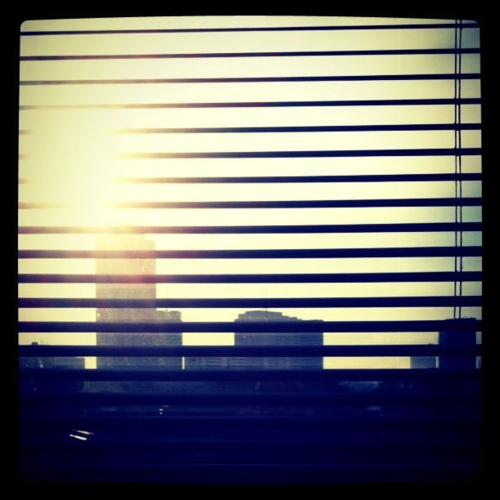 Reflections of a Grady Doctor: Hurry up and wait. Slow down, you movin' too fast. ~ Simon and Garfunkel "59th Bridge Song"
I was holding a patient's hand yesterday. She was the last person I was seeing on rounds that day and it had been a long day. I was feeling over-scheduled and over-tired and over-everythinged. The clock was on my back and the list of things I had to do at home was just as long as the one I had finally finished at work. It was already 5:20 P.M. The sun was already on a downward descent and late afternoon sunshine was peaking lazily through hospital blinds. And today, there wasn't much going on with her so I felt confident I could get out in time to get both kids on time. If I hurried, I'd be just fine. There was a procedure that she'd needed and that procedure had been done. She'd tolerated it well and all of the teams of physicians caring for her were now working in a lovely three part harmony. Plans clear. Clinical course, at this point, predictable. This was supposed to be a quick in and out visit. A chance to check on her pain and see if she needed anything. What would work best for my schedule would be for her to say, "Nope, I'm good" or even ask one obligatory question to which I could quickly answer. "Hold my hand," she said. She was telling me more than asking me, so I sat down on the edge of her bed and did what she said. "You okay?" I softened my voice to let her hear my concern. And to hide my ticking time clock. "I'm fine. I just want you to hold my hand for a little while that's all." "Okay," I answered. "I can do that." Because even at 5:22, I could. At least for a moment. So I held her hand and waited for her to say something but she didn't. She just sat there watching Judge Judy and not even looking at me. The silence was killing me so I made some small talk. "Are you moving your bowels okay?" "I am." She nodded her head while saying that. Keeping her eyes on Judge Judy. "Just a little. But the pain pills help mostly. So mostly no pain." She shook her head. Back to Judy. I softened the grip on her hand and she sensed it as the warning that I was trying to leave. Her fingertips pressed into the back of my hand. "Don't go. Can't you just stay with me for a little while?" Eyes off the television and now on me. I didn't respond. Instead I just sat still to show her that I'd try to stay a little longer. Even though I really needed to go. I looked into her eyes. They were unusually wide like brown saucers. "You sure you alright?" I finally said. "You know? Nothing is wrong right now. I just like you. I like your voice and how you look at me. It makes me feel better for some reason." My face immediately grew hot. "I like you, too." That was all I could think to say. But at least it was true. After a few moments, she let my hand go. Then she said, "I know you got to go. You probably got to go on home or see other patients and I know that. I can tell you a busy person. But you know what? You got this special thing about you that don't make people feel rushed. Even when you in here quick it feels like you got time for me." I sat there speechless. I thought about how many times this week I'd already told my kids to "hustle up." "If you feel rushed I guess it don't even matter if it's not a rush," she added. I thought about the last thing I'd said to Isaiah as he dawdled that morning before school. "Come on, buddy. Sense of urgency, bud, let's go. Hustle up." Even though we were making good time this morning. "I guess perception is reality." She looked over from Judge Judy. "What's that, Miss Manning?" "Just what you said. What it seems like might as well be how it is." "You know what? I was kind of in a hurry when I came in here. I can't lie." Now she was off of Judy for good. She smiled at me sideways. "But you didn't make me feel like that, see." I squinted up at Judge Judy and then looked back at her. The verdict was just about to be rendered. This let me know that it was very close to 5:30. And that I still needed to go. "You know? Some days I'm pretty sure I don't get it right." I grabbed her hand again and squeezed it. "Man. I kind of needed that today. You must have sensed that I did." "No, Miss Manning. . . you know. . . actually I didn't." "Well, it seemed like you did." We both chuckled. "So what it seem like might as well be how it is. Right, doc?" I paused for twenty more seconds after hearing Judge Judy bang her gavel. Judgement for the plaintiff. The credits started to roll and a commercial came on. "Alright then, Miss Manning." She gave my hand a pat of dismissal. I stood up to leave and headed toward the door. I flicked off her light switch and replied, "Alright then." You know, I've met a lot of doctors in my day, but I've never met one like you. It's really amazing -- you're amazing, and I'm grateful that you reveal yourself, share your stories, your patients, your thoughts and wisdom. I'm just blessed listening to you. Lovely! It's so nice to feel like you have someone's undivided attention. I love that you take your time with patients. It's the number one trait I look for in a physician. It's so very important, I sometimes wonder why more doctors don't get it. So glad for your patients that you do. I love you a bunch!!! I'm proud of you a bunch!!! You are gifted far beyond what you can imagine. My chest is heaving and I am holding back tears of pride. As I read your words I remembered one of my secretaries telling me one day that I had missed my calling. She had a nameplate for my office entrance made and it simply read Padre. She shared with me that I had somehow figured out how to have people from all different levels in the company feel comfortable coming into my executive office to talk to me. I thought about that as I read your words. To radiate that feeling you must have a genuine concern and caring about the person that you are talking to. You can't trick a person into having that feeling about you if it's not real!! You have that gift... Keep making us happy!! !